Take your bicycle and do a spin along the Dublin waterways. Take your bicycle and do a spin along the Dublin waterways – the Irish motorways of the 19th Century. Irelands canals were the motorways of the late 18th and 19th Centuries. They were an extraordinary engineering feat that allowed for goods to be transported to and fro from the capital city to the bustling port of Limerick on the west coast, making safe and reliable a route that previously either risked shipwreck on the rugged Atlantic coastline or took an age through the almost primordial roadways of the interior. Naturally, in time the railways made the waterways redundant, and by the 1960’s the had fallen to complete dereliction and abandonment. 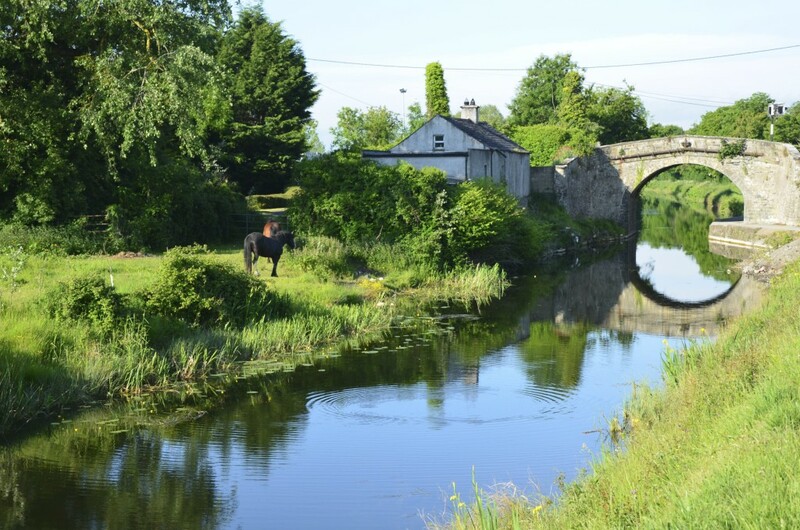 Thanks to the efforts of a number of campaigners, both canals have been superbly restored in recent years, and two walking routs were created, following the canal banks all the way from Dublin city to the river Shannon in the Midlands. These paths make a delightful detour for an intrepid cyclist and also as they pass close enough to each other in County Kildare, several combinations of routes present themselves to make the area one that can be enjoyed time and time again. 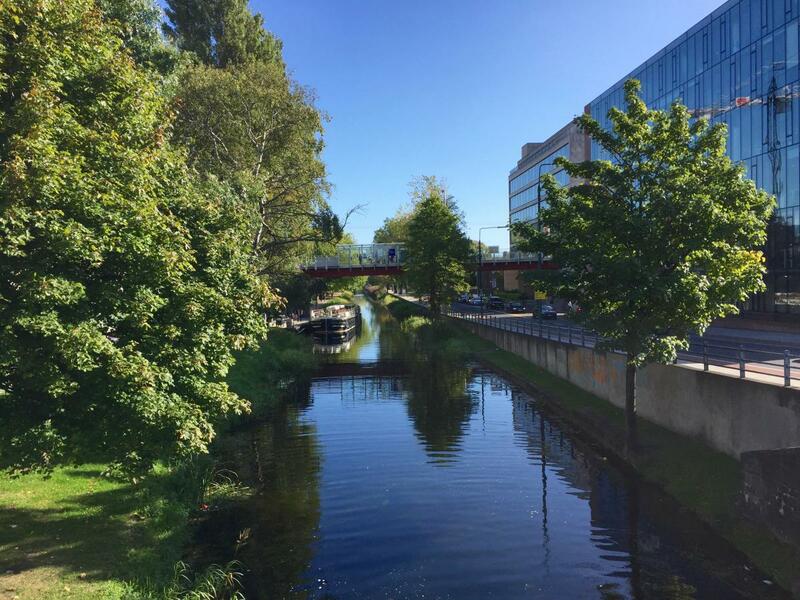 The Royal Canal, the longest of the two at 164k, begins just beside Dublin’s new Conference Centre on the banks of the Liffey. However, its first few kilometers are lost amongst the urban sprawl, only accessible from the national stadium of Croke Park onwards. This is a very urban and unappealing part of Dublin, evident from broken glass and refuse generally strewn along the path, and unfortunately antisocial behavior is not uncommon. Anyone cycling with children would be well advised to skip the first few kilometers, and join the canal at Phibsboro, or by boarding an intercity train in the city center at Connolly station and embarking a short time later at Ashtown. From this point onwards the canal quickly forgets its ugly industrial origins and a sense of traveling through of a hidden rural haven becomes evident. A hybrid bike with thick, gripping tires is the ideal mode of transport as the path changes frequently from single track, to gravel and where tarmac does appear, it is generally in very poor condition. Panniers are not advised as narrow gates appear frequently to stop livestock entering the waterways. The path from Ashtown through Castleknock is quiet bumpy and tricky if the weather has been wet, and is probably the only challenging section of the entire waterways, not helped by the great height the path passes above the canal at times and is advisable to pass at a careful pace. This section lasts little more than a kilometer before the path returns once more to a less vertiginous level and from here on its plane sailing, and an easy cycle by any standards throughout its length, even as far as the River Shannon. The city quickly seems a forgotten memory, until the occasional sound of a passing commuter train becomes the only reminder that a populous city lies nearby. At times the rail line follows so closely the contours of the canals that it forms and interesting reminder that during the rails expansion in the 1950’s, it was considered filling in the canals and building the railway atop them. Fortunately, the drainage of the waterways was deemed too big a task and the notion abandoned. In no time the pleasant towns of Lucan and Leixlip and their environs are passed. In these towns and throughout this this whole region, traces of the legacy of British rule can be discovered, for this fertile land was also once the home for a number of great estates and the country homes of the landed gentry, and some of Irelands most extraordinary Georgian architecture is to be found a mere stone’s throw from the waterway. So much of this region is deserving of extended exploration, but if you are pressed for time, the beautiful town of Celbridge with its extraordinary Castletown House is well deserving of a short detour. It is also worth remembering that as these towns form a populous commuter hub, it is always possible to arrive from or return to the city on one of the frequent trains allowing for a long day of exploration before putting your feet up and being whisked back to the city. However, it pays to be aware in advance of some restrictions on bike transport on Intercity trains (www.irishrail.ie). Further along the canal, the university town of Maynooth is passed, before the busy market town of Kilcock is reached, with its strong rural flavor, seemingly a world apart from the urban sprawl of Dublin, and serves as a reminder that not only have you now left the city behind, but too the country of Dublin and are now deep in the rich farmlands of Kildare. 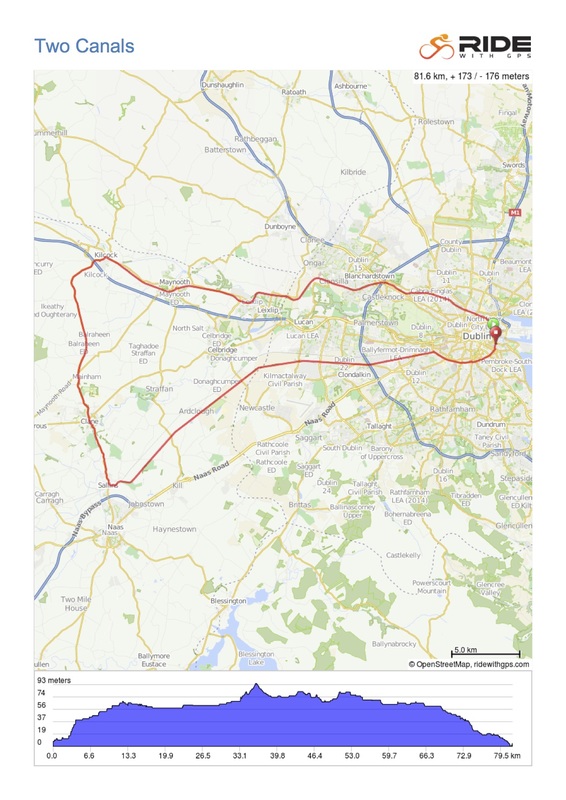 As previously stated, there are an endless possibility routes that may be created combining the two waterways, and indeed the course of the river Liffey. From this point it is entirely possible to simply follow the canal for its 165k to the Shannon, and a reasonably fit cyclist can easily achieve this in a single day, potentially returning that day on the train from Longford town. I cant recommend this enough as there are a number of very beautiful sections further along this canal, but in the case of this route, we will take a southern route to meet the Grand Canal at Sallins. There are virtually no dedicated cycle paths in rural Ireland, and the road from Kilcock to Sallins can be dense with heavy agricultural vehicles. It is imperative to stay close to the verge and if cycling in a group be careful to stay in single file. Despite the traffic, this is a very beautiful region of rolling countryside, little changed over generations of farming communities. Sallins was an important town on the Grand Canal route, and is still a popular spot for some of the small community who have made the waterways their home. A number of house boats are generally found to be berthed just below the towns historic bridge, and by the banks of a very appealing pub, and a good spot for a snack before beginning the return leg to Dublin upon the banks of the second canal. On departing Sallins, the Grand Canal at first makes an inauspicious first impression. Seemingly a considerably less well maintained waterway, with a number of muddy section without any dependable surface for cyclists, the first few kilometers can be particularly frustrating in wet conditions. This is a misleading first impression, and is soon dispelled as one of the prettiest and least spoilt sections of the whole waterway is shortly encountered, replete with vast swaths of reeds like golden wheat fields and often too the sight of huge colonies of swans. It’s not too long a more reliable surface reappears and the magnificently maintained gardens and outbuildings of Lyons estate draws into view. Considered one of the greatest gems of Irish Georgian architecture, and once the home of Ryanair founder, Tony Ryan, Lyons Estate is now operated as a luxurious hotel and restaurant of considerable repute. As with Sallins, the next section of the canal, Hazelhatch is long associated with a community of house boats and a great number are usually to be found along the banks here. McEvoy’s pub across the bridge is a splendid place to pause for refreshment as it is a particularly charming traditional pub with excellent Guinness, and if you are lucky with the weather, is as fine a location to pass a summer evening as any. After Hazelhatch, the city begins to gradually make its presence felt. The path becomes more firm and generally tarmac, and a frustrating number of the same type of metal gates from the Royal Canal begin to appear. The section from Ballyfermot towards the south city is a little gritty and contains some particularly ugly sites, however once Portobello in the south inner city is reached, the canal becomes a delight once more. The final section from Portobello to the Grand Canal Dock is one of the more popular recreational areas of the south city, and a number of popular pubs and restaurants are passed. A wonderful pop-up market appears occasionally along the final stretch near ‘The Old Schoolhouse’ bar, and its well worth timing a trip to sample some of the excellent food on offer. Take your time! The canals are their own contained microcosm, and once your clear of the city, time seems to stand still. They are a perfect place to while away an afternoon with a picnic and a good book, and simply watch the day drift past. Enjoy the wildlife. Elegant herons are a common site, and swans can appear in very large numbers in certain sections. Fortunately, unlike other waterways, flies are never a problem even in the hottest weather. Enjoy a historical detour. The excellent arable soil along the Liffey’s path was home to many a ruling Lord during the 18th Century and there are a whole host of architectural delights from Carton House and Celbridge’s Castletown House, to the ecclesiastical ruins of both Maynooth and Sallins. Have a pint! Some excellent pubs are passed on this route. chief amongst them are the rural idyll of McEvoys at Hazelhatch. The alternative Liffey route passes the Strawberry Hall which is a gem unchanged for a generation, and the Anglers Rest offers some of the very best seafood in the country. There are endless combinations of cycling the Waterways, and cycling the Grand Canal from start to end is the one I can’t recommend enough. For a much shorter day trip, the road along the Liffey back to the city is very appealing. 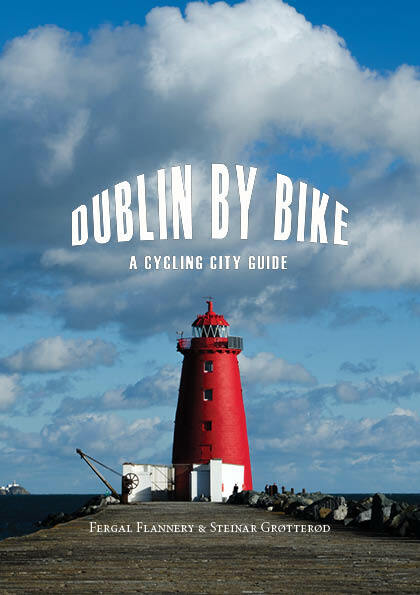 Its is an easy cycle from Grand Canal Dock along the canal banks as far as Harold’s Cross. From here its best to stick to the roads for the next few kilometers as there is no dedicated cycle path long the canal. Returning to the canal at Rialto, the Grand Canal Way can be followed easily from there on. After Lyons estate a large humpback bridge gives access to a minor road that leads backward through the Liffey’s demesne. A detour to Straffen is not necessary, but worth the extra few kilometers to see one of Irelands prettiest towns. Celbridge too is a wonderful town, with an immense country home, but traffic unfortunately can be very heavy without an alternative to avoid it. On reaching Lucan, ignore the signs directing traffic towards Dublin via the main road, and make for the Strawberry Fields, which is a particularly scenic route along the Liffey valley. Before long the city reappears at Chapelizid and there is the option of following the cycle land via the Phoenix park, or crossing the Liffey in the village and following a cycle path along the rivers banks. Cycling along Dublin’s Keys can be a nightmare for those not used to urban commutes, and although not technically allowed for cyclists, following the Luas’ tramlines is a much safer return to the city. The Grand Canal near Grand Canal Dock.